Just a quick catch up from last week. 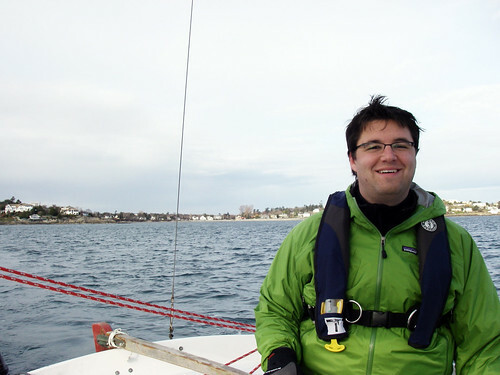 I got so carried away with the marina issue, that I forgot to write up my sailing fun last Saturday (Feb 14). We got some actual sailing weather and got farther and moved faster than most of our days so far, eeking about 7 knots out of the Cal20. The window was only open for a few hours in the afternoon, so we made the call and got down to the marina. The wind was blowing down from the northeast at about 10 knots on shore. 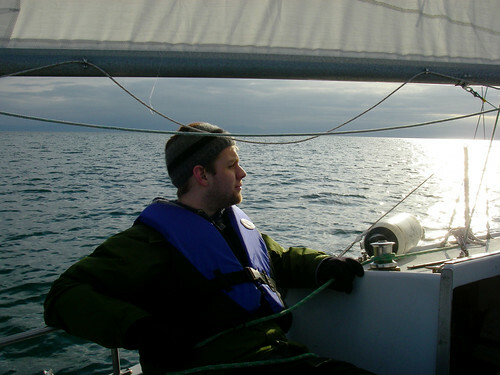 Needless to say, I like sailing more on days like this, especially in the winter when it's colder. The currents were fairly slow, but we determined that the best timing was about 2:30PM. We set up the boat and I totally fucked up the whole getting off of the dock maneuver. It's been quite a while. I stopped us dead and let Aaron take over the helm. Looks like I have some skills to brush up on. 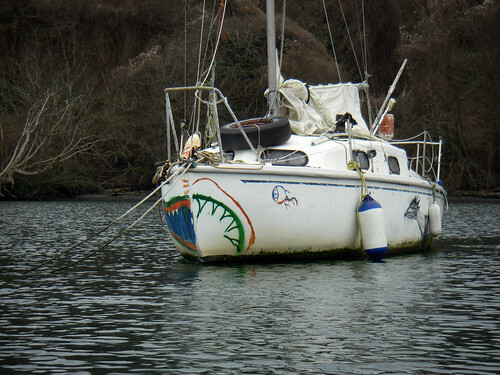 Once we got out of the marina and actually got the sails up, We were moving at a good clip down to Trial Island. We got all the way down to the cardinal buoy in Enterprise Channel before the current really started to oppose us. The flood had come a bit earlier than predicted, and it was just enough to kill any forward progress. 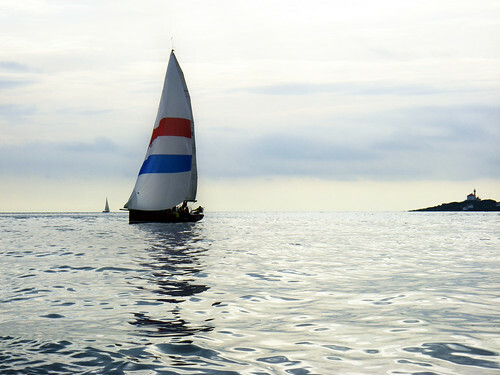 We motored through the channel to the other side of the rips, and we were sailing again. A couple of tacks got us right out to the tip of clover point. 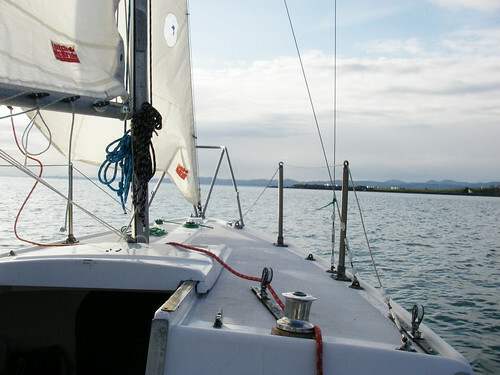 The sailing got a lot faster when we switched tacks and headed to the south tip of Trial Island. On a beam reach in a couple of the gusts, we were making 7 knots with a pretty good heel. 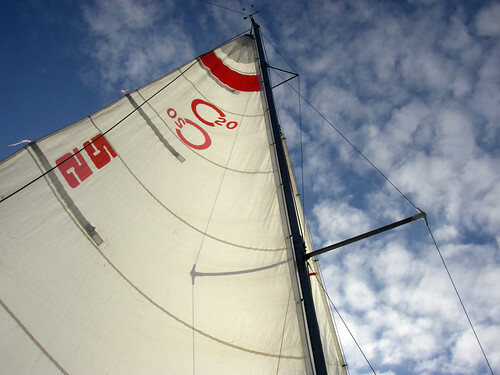 We had to sit on the opposite side of the mainsail in order to get less weather helm. The only issue with our plan was trying to get back to Oak bay. Oak bay was directly upwind which meant we had to beat quite a few times to get closer on such quick tacks. We did all the beating we could stand and just went over to motor before it got too dark outside. It was a pretty cold ride back into harbour and we got docked without sparing even a second. 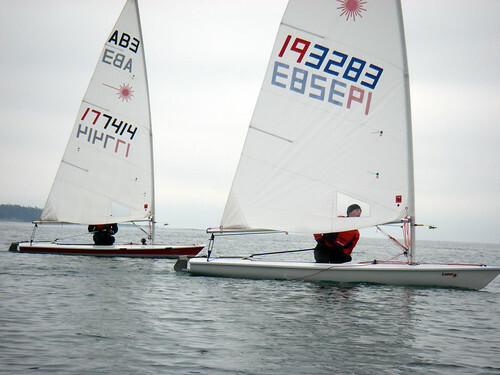 The whole sail was a great improvement over our last few attempts. I'm almost thinking we're getting used to sailing this little boat. So tonight I headed down to the City hall and listened to the discussion about the marina project in esquimalt. After what I heard tonight, I am left with rather mixed feelings about this project: on one hand, I am delighted that we're entertaining new marina development. On the other, this project has no value for me and seems to hurt locals in the name of tourism. I'm certain that this development has already been fully green-lighted and it's like on a fast track for marketing material to hand out at the Olympics. As a brief overview, the meeting, packed to the ceiling with people, began with Denise Savoie making some fairly strong political statements about her biases and then Slick, one of the reps for the project and also the worst public speaker in the universe, proceeded to a delightful PR laden, brainwashing Powerpoint presentation. Conspicuously missing were the developer himself and a representative from Transport Canada. Like most unexciting and banal powerpoints, it went on and on and on and eventually the rep was cut off (thank god). The rest of the night was people putting their words into a microphone with no meaningful public response, broken only by a girl who budged in line and yelled a number of undecipherable phrases about the marina not being sustainable and then stormed out the room on a wave of boos. Overall..I feel government work was done. So what's my beef with the marina as presented? I mean I do like fun, right? My problem is that it's not for me. Plain and simple. It's for them, it's change, and I don't like it :D . I could go one for hours how I think it's a poor design with terrible access, insufficient depths, and close proximity to aircraft engines that needs an entire basin dredged over a 2 year period, basically needs the entire traffic scheme changed to accommodate it, may or may not be ecologically sound, no experts seem to agree on the parameters, no government oversight of the waterway, fucks paddlers sideways etc etc etc yada yada yada. but when it comes down to it, it offers no value to me and, in-fact, subtracts value. And this is the problem with change. This project has been on the books since the late 1980s. It's been looming, it's been dormant, but now here it is. This fine project is going to adorn the west bay and north shore and there isn't a damned thing we can do about it. This project is about servicing a small niche of boat owners that are ridiculously wealthy, on top of the world and ready to bring our economy some love. As long as you keep the blinders on and keep watching Slick's little powerpoint, I mean what could be better. I'd love to have a swinging hot tub party on my private mega yacht. But I won't, and neither will I'm guessing...uh.. most of the human population. As Victoria famously does, it takes the needs of tourists and makes it paramount to the functioning of the world. In this model, you take a beautiful walking space, a rocky park, a scenic viewpoint and you replace it with development that bleeds out rich patrons ( a little after the Olympics :P ). In this case we're being double screwed, because the provincial government is in on it. Normally, a developer has a couple of lots of land on shore - cool! make a nice little pub with a huge patio. But in this situation, Victoria has agreed that this makes them money (potentially), so let's rework the entire harbour access scheme and give them some water while we're at it! So here's how change is going to affect me. 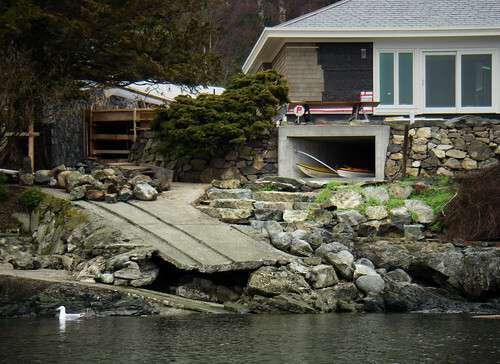 I no longer have access to the rocky shores of the north shore, instead I'll get a beautiful view of concrete, screws hinges, sewer and gas lines and a pool of bottom paint infused water to paddle through (until there's an incident with a 30 million dollar boat and a kayak). If I don't want to paddle through the marina - I can go around it! Well.. no.. the airplanes taxi out through there - but they might not, but they might. Tell me how this benefits me in any possible way? I'd be a lot more fond of a project like this if it stored normal people boats, wasn't a giant nuisance to navigate for those of the paddling persuasion and somehow benefited the local population by not slapping concrete all over the shores. Change is coming like it or not. Like one of the public said today - all marinas are a work in progress. If they can't make a mega yacht marina work, then maybe my little dream will come true - a smaller marina and happy Kayakers. What do they mean by MEGA YACHT MARINA? My MP sent me a letter the other day about some interesting news, and a day later it was in the Monday magazine and now the VCKC is engaged. There's a developer lurking out there who's trying to quietly pass a massive harbour development over in Esquampton. What the exact parameters of this project are, I'm really not sure, so I think I'm gonna go sit in at the public meeting at city hall on Tuesday night. This should be cross posted to Kayakyak as well. I think that Najad 570 I've been looking at will finally have a place to moor. Tuesday, February 17th, 2009 7:00 p.m.
After about a 2 month hiatus, due mostly just to crap weather, my friends and I climbed aboard the little Cal 20 again and headed out to find some wind. 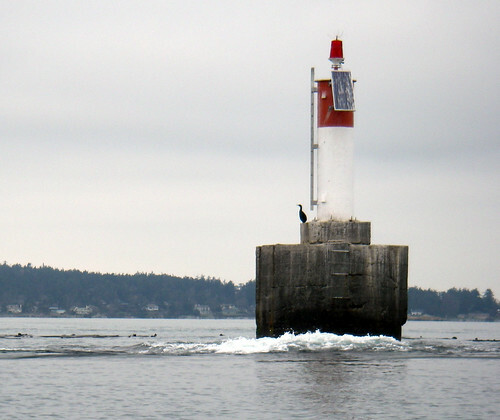 We left the harbour and headed south thanks to some beneficial currents. We were in the midst of a little sailing race, and we could see that Caddy bay was alive with all manner of sailing vessels. The wind was with us until about Trial island, where the wind dropped off and the water became glassy. 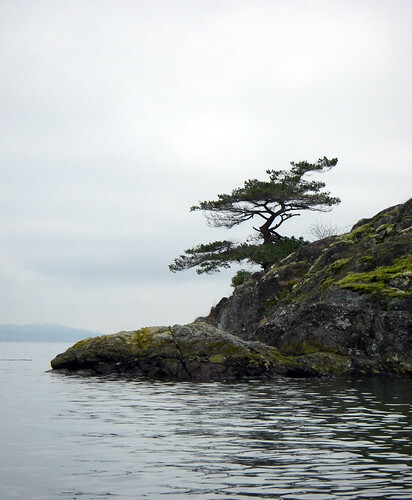 We motored to clover point until the wind freshened up a little bit and set sail around Trial island's south tip. A few of the racers managed to get around Trial, but one was completely caught out when the door closed on any headway. We had to motor all the way back to the marina as the ocean went still. A fun little trip and we're finally starting to get a hang of light wind handling. 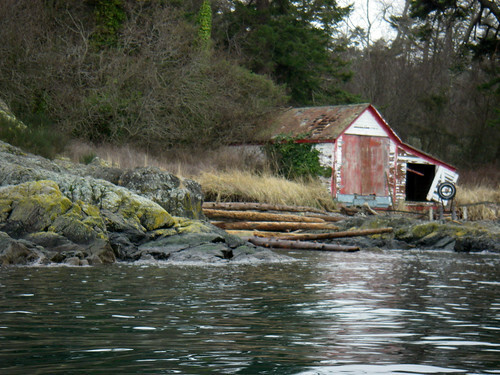 I returned to good ol Cadboro bay today for a nice paddle in the lazy currents and good tide height. The plan was to circumnavigate Chatham and Discovery the long way around. The water was very calm today with only little wisps of air gracing its surface. The weather was more or less... typical. Not raining, not sunning... just gloomy and cold. Hey, it's still winter. It took about 15 minuted for my van to de-ice and get warmed up. When I took the boat off the rack, it was covered in ice too. Joy. I got the boat rigged up and got myself in, wading in the crystal clear water. 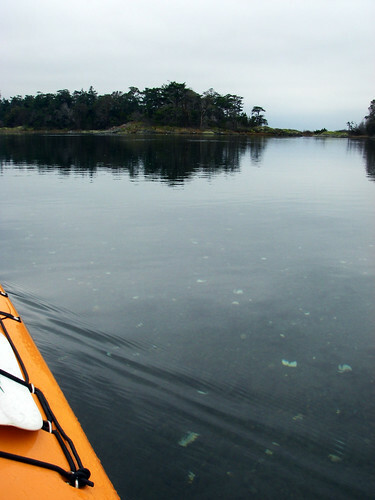 I was following a small group of kayakers out of he Bay, the crossed at the mouth of the bay and headed toward Cattle Point. I was grinning as I saw Baynes Channel from Flower Island, it was just flat, grey and unadorned with any sign of tidal rips. I scooted right to the north tip of Strongtide Islet and along the coastline of Chatham, where I took this cheeky video. The video is showing the contrast between my goofy bathtub and the last blog that talked about the rip at Ten mile point, which I highly recommend reading if you haven't already. The water was little wavier on this side, but not much was going to get the ocean moving today. I ducked into a little inlet that led to a fantastic little side trip right into the heart of Chatham Island. I'm glad I was gifted with a nice high tide today as it let me access this beautiful little lagoon with a small islet in the southern extreme of the waterway. There were many varieties of birds here, small harlequin ducks, eagles, herons, oystercatchers, gulls of all kinds and most importantly, geese. As I paddled over gravel and shells with only a hint of blue indicating there was water between me and the sea floor, I was getting honked at. 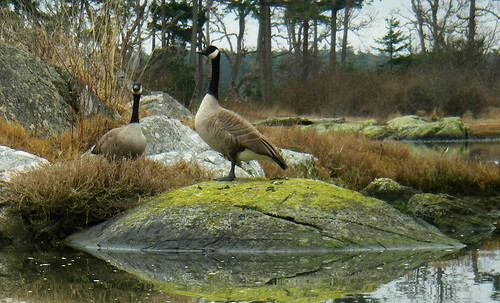 The geese had seen my clever plan to enter their water with my kayak and were.. um.. cheering me on. 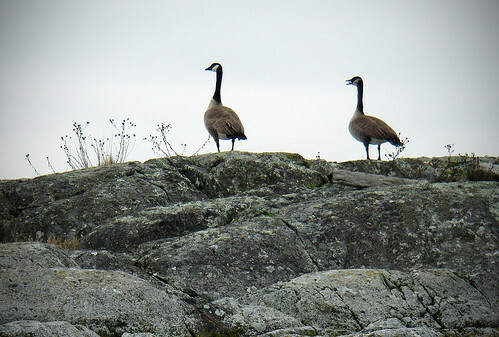 I approached the source of all the commotion, and a few groups of geese were resting on a jaw droppingly beautiful little island full of arbutus trees, bright green lichens and a red tinged plant that grew right into the rocks. I'm not sure how any of the plants get any kinds of nutrients, as they're growing right out of a rock. It's one of those places where I just took a moment to really take it in. The geese were happy I'd left and had fallen silent. It was then I heard the faint noise of a rooster crowing somewhere far off. That's how quiet this place is. 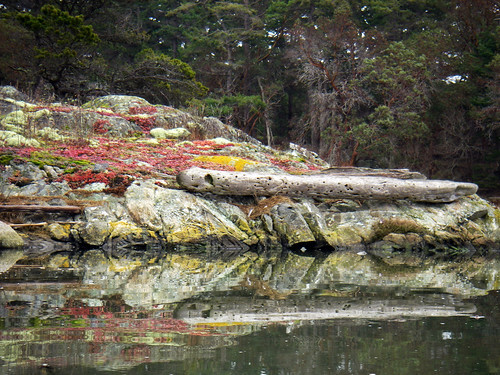 Reluctantly, I left this little lagoon and saw another neat little thing that I love about paddling at Chatham Island. The trees here have been sculpted by the wind, who embodies a madman with hedge clippers that has crafted his own little Bonsai tree farm. The trees have had every branch facing the wind ravaged, so all of the trees have ended up with a distinctive posture. Getting back to the point, the one I saw today reminded me a bit of that old Disney movie, The Flowers and Trees. You can almost see the bad old tree caressing the reluctant belle. Discovery had only one big difference today.. none of the kelp was afloat. The little tops were sticking up, but there were almost no floating bits. It made going around Discovery island a pretty simple task. The old lighthouse is looking pretty bad these days. looks like the wind and humidity have been stripping off big swaths of paint and planks from the surrounding buildings. The foghorn station is getting marine algae growths which has stained it slightly green. The East portion of Discovery was unusually empty: no campers, no boats. All there was to see was a number of massive cargo ships making their way up the inside passage (storm's coming Monday by the looks of it). Those cargo ships sure do light up the VHF something fierce, but to top that all off there were two Navy vessels sneaking through that needed to be boarded and inventoried. I turned the radio down a bit with all that natter. 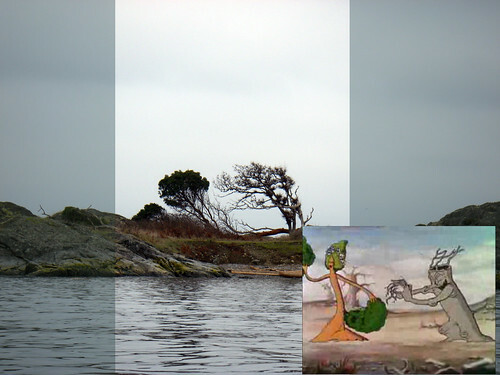 At the southern part of Discovery was an errant tide rip where the sea moves over the shallows. 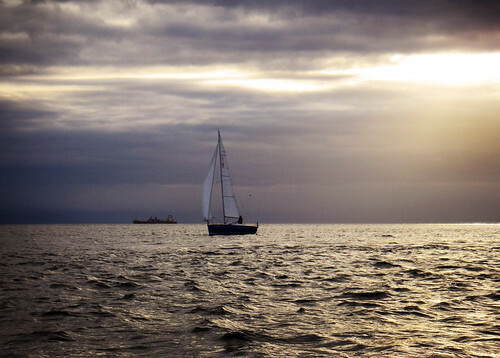 The tidal predictions were really good and makes me want to go out sailing. I ended up at the Chain islands and the birds were not here. The islands were totally empty of birds! I guess all the gulls had chosen other roosts, so the seals moved in. Lots of seals were watching me and doing a peculiar thing that looked kind of surreal. The seals were sitting on rocks maybe an inch below the tide which made it look like they were levitating on the ocean. A couple of deadheads were doing that too. I paddled over to Oak bay and found a nice little jet of current that took me swiftly to fiddle reef where not one, but two eagles were watching for food. They didn't notice that I was taking awful, blurry, crap photos of them. Sorry readers - I'll let John get the eagle photos next time. You've seen eagles: graceful, awesome looking... my photos were brown blobs, which wasn't the gestalt I was shooting for. I paddled right into a regatta of laser boats and starting snapping photos before I realized I was kind of in their way. It's not every day the laser crew make it out past the mouth of the bay. I ducked in behind the rocks to keep my distance as another wave of sailing dinghies sailed past. I need to start knocking on some doors around the uplands. I found a few places that I'd like to rent from. Scccrrraaaape. Knocked out of my daze of waterfront house shopping, I realized the tide wasn't as high as I'd hoped. I gave my kayak another battle scar just outside the RVYC marina for the reason of: being awesome. I paddled around the mooring field and found there are others who take boating just as seriously as I do. This one had one of those angry aircraft face things on it, but it was exceptionally not well-drawn. I headed back for the car and beached the kayak just as the sun came out. It's all good though, I took the scooter out and burned off some gasoline along some twisty roads to celebrate.